2 Comments Thursday, February 5th, 2015. Red Halloran, senior rescue from Double Dog Rescue in Farmington. February is National Pet Dental Health month. For over twenty years, veterinarians have been using this month as a chance to educate owners on the importance of pet oral hygiene. Dental health is about more than bad breath! Although it is completely preventable, periodontal disease is the most common clinical condition seen in dogs and cats. The American Veterinary Medical Association (AVMA) reports that 80 percent of dogs and 70 percent of cats show signs of dental disease by age three. Plaque and tartar buildup can not only lead to gingivitis but, if left untreated, infected gums can lead to pain, tooth loss, and life threatening health conditions. Because oral bacteria can enter the bloodstream, poor oral health can lead to systemic problems involving the heart, lungs, kidneys, and nervous system. Since pets can’t tell us they are in pain, they need regular veterinary exams. In addition to bad breath, some other signs and symptoms of dental issues include disinterest in food, tender mouth, and discolored, loose, or tartar covered teeth. Although tartar can be visible on the crown, the area of true concern is tartar below the gum line. Red swollen gums and frequent pawing or rubbing at the face and/or mouth can also be signs. Even something as nonspecific as unusually grumpy behavior may be due to dental disease. Regular oral health exams by your veterinarian can catch oral disease before it progresses to lost teeth, bone loss, bone infection and potentially even jaw fractures. A great example of the importance of pet dental hygiene and regular veterinary visits is Red, a 9 year old Redbone Coonhound. Red was rescued by the Halloran family in 2014 from Double Dog Rescue of Farmington, CT. Their daughter volunteers for the rescue and when they saw Red’s picture and description; they knew he was the dog for them. From the beginning, Red was well-behaved and true to his breed. 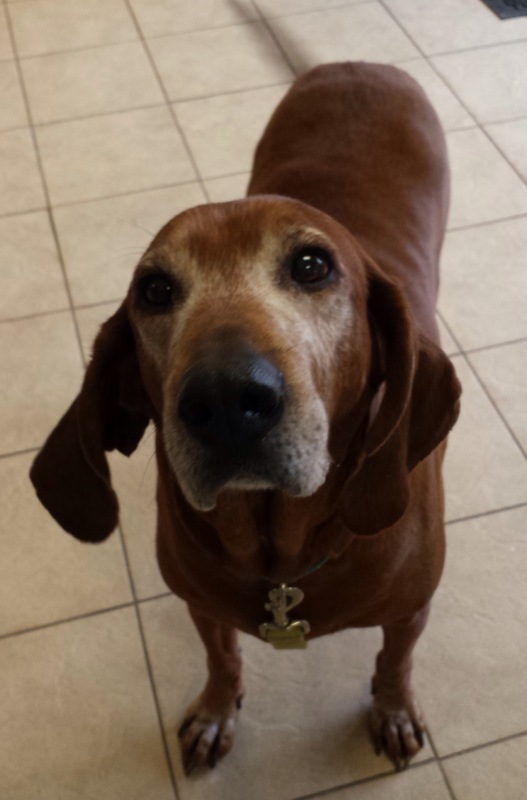 Redbone Coonhounds are known for being even tempered, good with kids, and loving to please their owners. They are instinctive hunting dogs, excellent water dogs, agile, and need a lot of exercise. His only flaw seemed to be his horrendous breath. 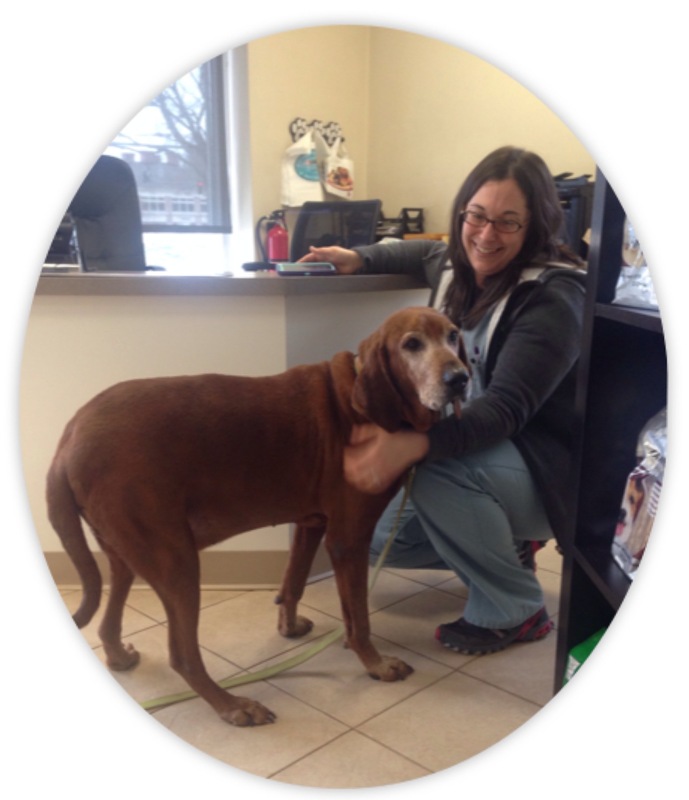 When Red first came to Progressive Animal Wellness, everyone instantly fell in love with him. While Dr. Shagensky found Red to be in relatively good health for asenior dog, an examination of his mouth discovered infection, severe periodontal disease, gingivitis and tartar. 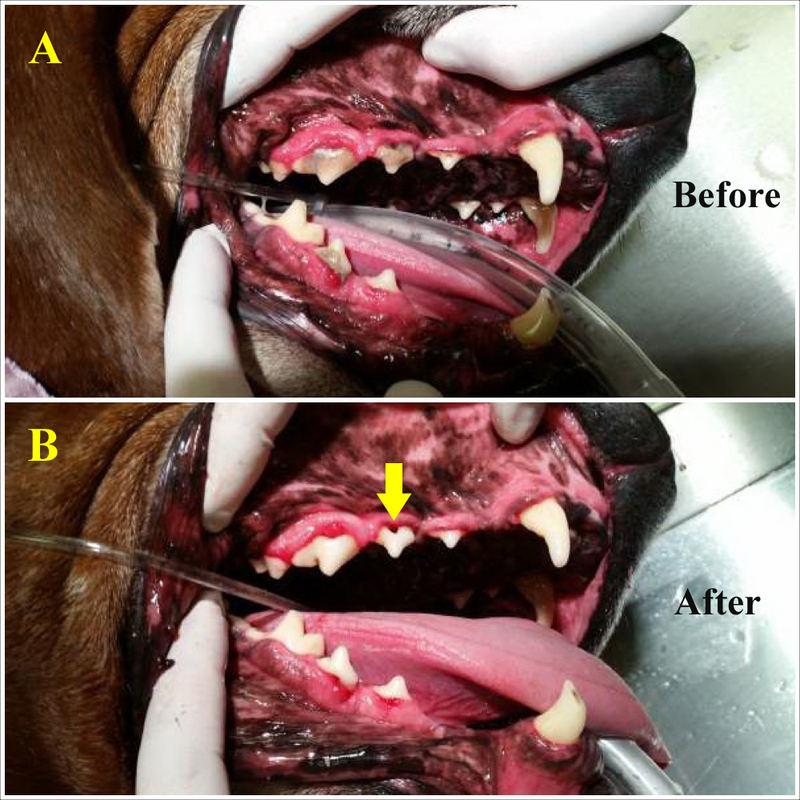 Treatment of Red’s periodontal disease required removal of 6 teeth and extensive ultrasonic scaling below the gumline. Pet dental procedures should always be done under anesthesia to ensure a thorough subgingival cleaning can be done. Without adequate preventative measures cleanings can come too late to save teeth and bone. 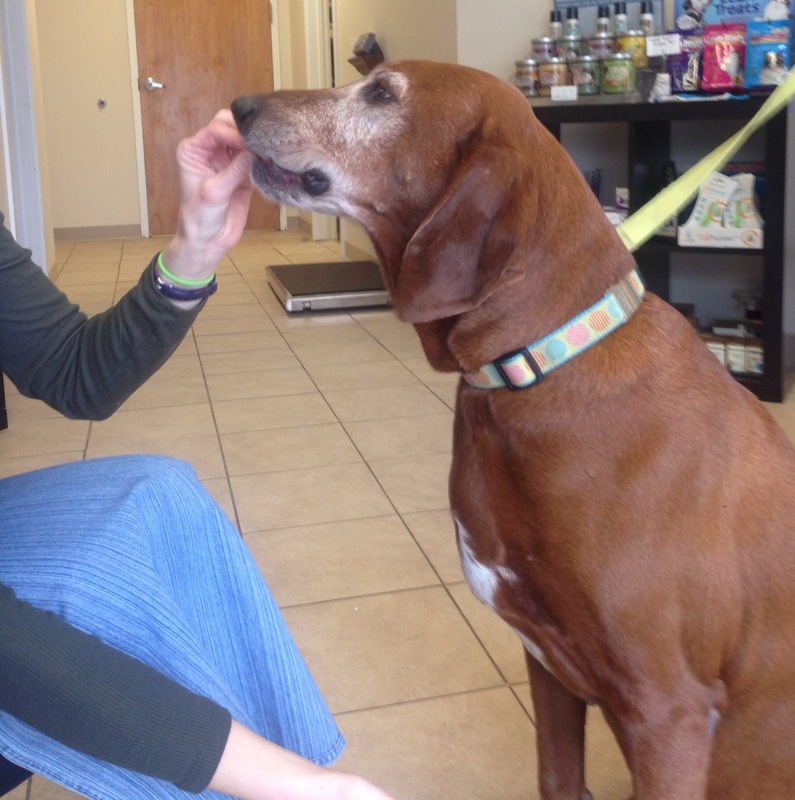 Since the dental procedure, Red is a happy dog with a healthy mouth and much less chance for infection related complications. Now that Red has found his forever home with a caring family, regular exams, preventative care, and proper home care can keep him from losing any more teeth. A. Red’s mouth before dental. Note the brown tartar over many teeth. B. Red’s mouth after dental scaling. The yellow arrow indicates an area of serious decay previously obscured by tartar. Oftentimes when you rescue and adopt a pet you won’t know its history, and especially with a senior pet, there can be underlying health concerns. Petfinder.com conducted a survey which concluded that the typical pet spends about 12 weeks on the site before finding a new home, but senior pets’ profiles remain on their site for nearly four times as long. But, senior pets deserve loving homes too and can be just the right fit for some families. The Halloran family welcoming Red is a great example of what it’s like to rescue just the right pet and truly give them the life they deserve. Red is a wonderful addition to their family, bringing much joy. Not only did they give him a new life, but because of their dedication to his overall and oral health, he is on the path to live his new life to the fullest. Now, Red has fresh breath and loves going for walks with the family. He loves running ahead, pausing, and calling to them with a distinctive baying bark. However, while inside the house he remains quiet except for when he “talks” to them. His family is quite fond of his “lovey noises.” Red is very expressive and we think what he is trying to say is, thank you for rescuing me and for caring about my oral hygiene. In observance of Dental Health Month this February, Progressive Animal Wellness (PAW) is offering 10% off routine dental care complete with a complimentary dental health kit filled with the tools you need to keep your pet’s smile bright. For more information or to schedule an appointment, please call the clinic at 860-325-2124. You may also visit www.progressiveanimalwellness.com for more information. 2 Comments for Red’s Dental Health Story- Fewer Teeth but a Bigger Smile! We are so happy he found a loving home and that you brought him to us for care. He is a sweetheart! !